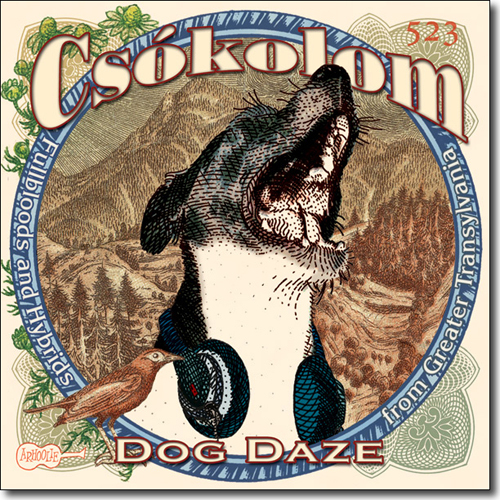 Csókolom's third album continues their mission to make sounds from another time sound timeless. These "Fullbloods and Hybrids from Greater Transylvania" show that they haven't lost their touch. Led by Jugoslav born Anti von Klewitz, this string quartet plays with raw intensity and vitality while maintaining their trademark virtuosity. Anti von Klewitz (violin, viola & voice) , Sander Hoving (kontra, violin, viola) , Anneke Frankenberg (violin, viola) , Jens Piezunka (double bass) , Lulo Reinhardt (guitar on 8 & 14). 1. AllMusic by Ronnie D. Lankford, Jr.
New Europe meets old Europe on Csókolom's Dog Daze, an intoxicating cocktail of an album mixed from traditional gypsy music, jazz, and classical. Anti VonKlewitz, Sander Hoving, Anneke Frankenberg, and Jens Piezunka build their arrangements from violins, violas, and a double bass, and rely heavily on traditional Eastern European (Hungary, Bulgaria, Transylvania) folk music for their repertoire. VonKlewitz handles the vocals, which are also sung in Eastern European languages, but are translated into English in the liner notes. Csókolom easily moves between songs like "Ando Tyire," which strikes one as ultra-traditional gypsy folk music, to "Eastern Comfort," which is also traditional but sounds contemporary enough to work as a television theme song. "Fi Barbat," on the other hand, has a jazzy undertow, aided considerably by Lulo Reinhardt's guitar work (which sounds a lot like Django Reinhardt's work). The VonKlewitz original, "Lahore," ventures closer to classical, but in a lively fashion that never reminds one of National Public Radio at its most sleep-inducing. Dog Daze, at nearly 65 minutes, is a generous album, and if the various styles don't always flow easily into one another, it nonetheless keeps the music from falling into a rut. For fans of Csókolom's previous albums, Dog Daze will be a welcome arrival.